ARLINGTON, Texas – Alvaro Aguilar Alvarez’s lasting impression at the Sydney Global Cup was him being blasted by Take The Gamble and being knocked unconscious inside Qudos Bank Arena. Eight months later and his new memory will be the 27-year-old pumping his chest and doing a slow motion dance inside AT&T Stadium. Alvarez rode Harold’s Genuine Risk for 85.75 points in Round 1 of the WinStar World Casino & Resort Global Cup USA, presented by Monster Energy, to help lead Team Mexico to a surprising fourth-place finish on the first night of competition. “I’m really, really happy because I really enjoyed the bull in this round,” Alvarez said with the help of his coach Gerardo Venegas translating. “I enjoyed getting on him. I’m starting to get more comfortable with these kind of bulls. Alvarez was bucked off by Canadian Mist in 3.46 seconds in the Bonus Round. Venegas was impressed by Alvarez and his Round 1 performance, which was why he went with him in the Bonus Round. “That kid rides,” Venegas said. “I was telling people yesterday, he and Francisco Garcia (Torres), all those young guys, Esteban (Bustamante). They’ve got a lot of talent. They’ve just got to put it together, but so far they’ve been riding good. Team Mexico (2-for-9) trails event leader Team Brazil by 425 points heading into Championship Sunday. Jorge Valdiviezo was the only other for Mexico to reach 8 seconds with his 84.75 points on Throwdown. Venegas was happy with his team’s performance overall. The first Mexican bull rider to qualify for the World Finals stressed to his team all week to not let the scope of the Global Cup stress them out. Mexico has finished in last place at the first two Global Cups. Mexico will be looking for their best-ever finish in international competition. The team has never placed higher than fourth in the old World Cup format. Team Mexico alternate Luis Escobedo is getting called into action to replace Edgar Durazo. According to Dr. Tandy Freeman, Durazo was transported to a local hospital for additional evaluation for a pelvic contusion. Durazo was stepped on as he tried to hang on for a qualified ride aboard Pennywise (7.58 seconds). 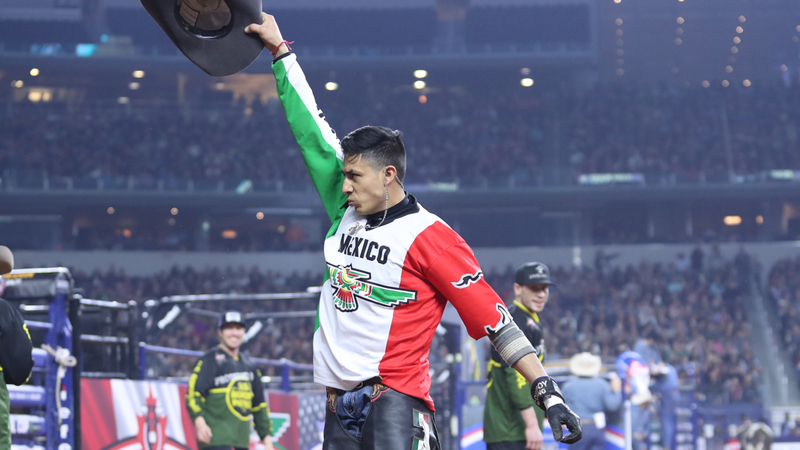 Escobedo ended the 2018 PBR Mexico season with four consecutive rides.